Generally I am not a fan of blatant advertising on my blog. I am not even really a fan of Black Friday. My husband and I are planning to avoid all malls and major shopping centers, and we’re hoping to hit up some Washington County Winery Opening Houses instead. However, I discovered this Black Friday deal that is too good not to share. Recently Powell’s Books and other indie bookstores have begun to sell Kobo eReaders as an alternative to the Kindle and the Nook. There’s the Kobo Glo eReader, which retails for $129.99 and is comparable in features to the Kindle Paperwhite and Nook Simple Touch. 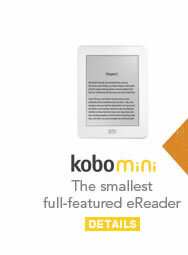 My personal favorite, however, is the Kobo Mini eReader, which markets itself as the world’s smallest full-featured eReader. The Mini is also much friendlier on the wallet, with a standard retail price of $79.99. But on November 23 & 24 only, it will sell for only $49.99. The actual size of the Kobo Mini is much larger than pictured. The Kobo Mini eReader has a 5″ glare-free E ink touchscreen, 2 GB of storage, built-in WiFi and is compatible with EPUB, PDF, JPEG, GIF, PNG, TIFF, TXT, HTML, RFT, CBZ, and CBR file types. Kobo eReaders have instant access to nearly 3 million eBooks, including nearly a million titles that are completely free to download. As I am a member of the Powell’s Partner Program, if you do decide to take advantage of this promotion, I’d appreciate it if you click on the link below. 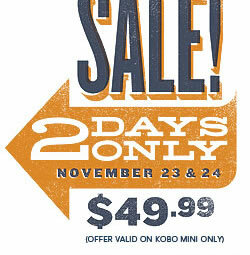 Disclaimer: Kobo Mini and Kobo logo are trademarks of Kobo, Inc. Although I am a member of the Powell’s Books Partner Program, all views expressed on this blog are my own. This entry was posted in Book Challenge, Movie Reviews/Book Reviews and tagged Black Friday, books, bookstores, eReaders, online shopping, promotion, reading. Bookmark the permalink.